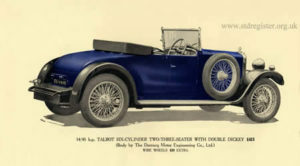 Clement Talbot Ltd was founded in 1903 under the patronage of the Earl of Shrewsbury and Talbot to import the popular French Clement car into Britain. From 1905, Talbots were also produced in London and the marque was very successful in competition and sales in the years leading up to the Great War in 1914. The first truly 100mph car! Talbot’s greatest success occurred in 1913 when Percy Lambert drove a 25hp Talbot 100 miles within an hour at Brooklands race track in Surrey. 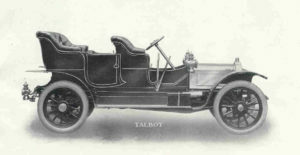 Talbot was taken over by the Paris based, but British controlled, Darracq company in 1919 and in 1920 this joint company amalgamated with the Sunbeam company to form STD Motors. (This being the origin of the present club name: “STD Register”). After the Great War the Talbot company, operating out of its factory at Barlby Road in London, had a rather lean time and its survival rested with a small 970cc ohv engined car called the 8/18hp. This was later expanded slightly to become the 1074cc 10/23hp both of which models were relatively successful at the luxury end of the small car market. Talbot’s survival however probably owed more to the support it obtained from the much more successful Sunbeam part of the STD combine; a situation which was to be reversed 10 years later. 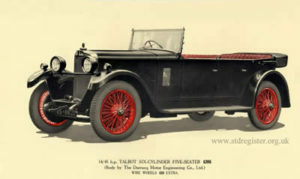 Sunbeam’s designer Louis Coatalen was in overall charge but the Talbot fortunes were really turned around in the late twenties by its Swiss chief engineer Georges Roesch who designed the 6 cylinder 1665cc 14/45hp model which was introduced in 1927. From that he developed a string of successful cars including the 75, 90, 105 and 110 models. A selection of representative types of Talbot car is shown below (click on images for a closer view). The 1905 Talbot 16hp car was the first all British model. Prior to this cars were imported from France or assembled from French parts. The Talbot 25hp car is similar to the one which made the first motor crossing of Australia from Adelaide to Darwin in January 1908. 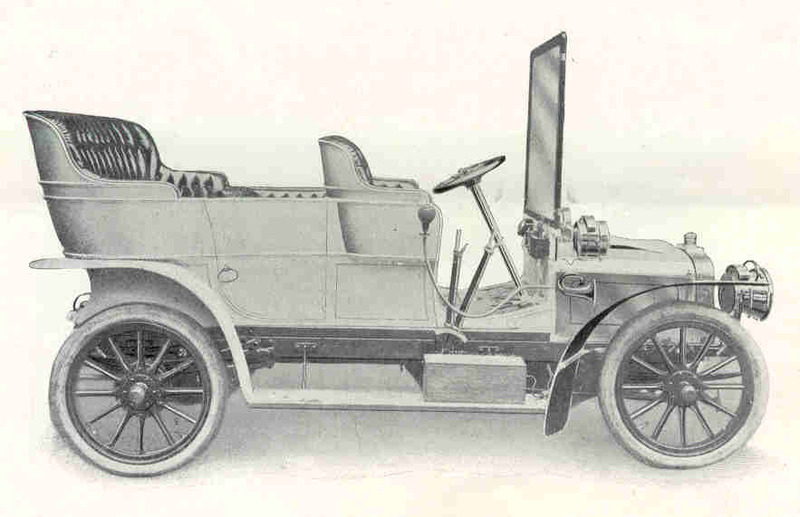 The 1914 Talbot 12hp, which produced about 28 brake horsepower, was a particularly successful model immediately before the Great War. Following the war Talbot kept its flame alive largely through the success of the small 970cc 8/18hp of which a 1922 example is shown. 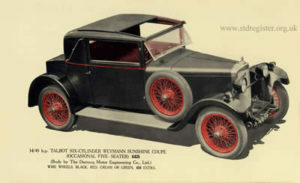 An engine of 1074cc together with a differential to the back axle were also available from 1923; this being the similar 10/23hp model as also shown. Both were capable of over 50 mph. Georges Roesch designed the 14/45hp Talbot which was marketed from 1927. It had a 1666cc six cylinder engine producing 45bhp and giving a top speed of about 60 mph. 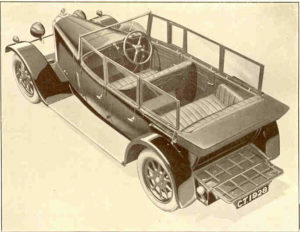 It was the only model produced by Talbot at this time, but marked the beginning of a transition. 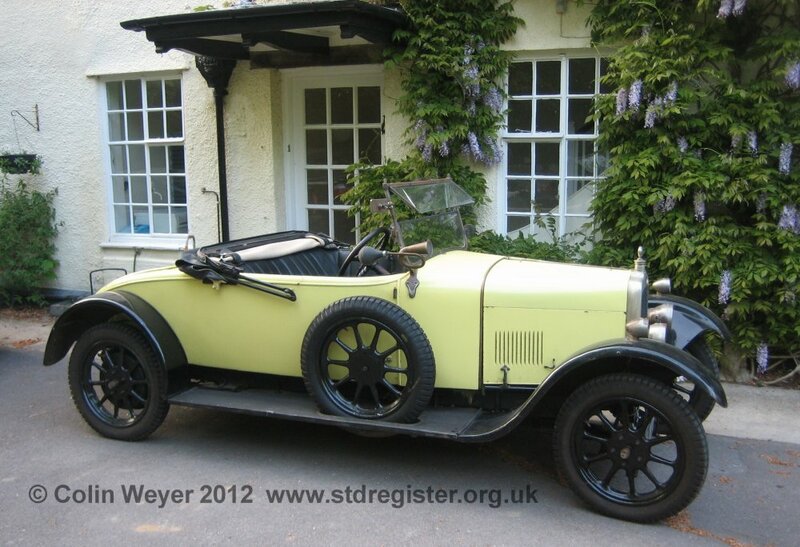 Prior to this Talbot was a liability to the STD group; it now began to stand on its own feet. This view of the 14/45 from the late 1920s shows the very spacious touring body with hood down but the side curtains in place. The luggage grid above the 14 gallon fuel tank is shown extended. It incorporated two direction indicator lights which were very advanced for their day. By 1932 closed cars were becoming preferred to open touring cars. This Talbot 75 (a development from the 14/45) has a 2276cc 6 cylinder engine and was one of the most popular models. 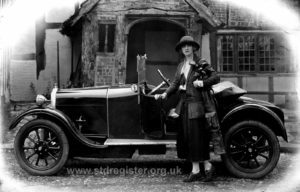 Its top speed of about 75mph was quite remarkable for a family car of its time. Talbot 105 Super Speed Model. This car achieved much success in racing and rallies and many Alpine trials during the early 1930s. It has a top speed of about 105mph. The 1936 Talbot 110 Speed Tourer and was the ultimate development of the famous line of Roesch designed Talbots. It has a 3377cc 6 cylinder engine producing 120bhp and every conceivable luxury extra available on a mid 1930s car. The theoretical top speed of this car in stripped down racing form was 110mph. It featured a preselector column gear change and traffic clutch which provided semi-automatic gear changes. 1929 Talbot 14/45 chassis. 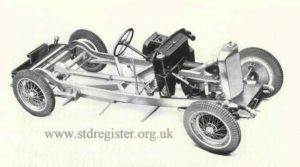 This style of chassis was common to most cars in the STD Group. The location of the brake and gear lever on the right can clearly be seen and, again, was typical of most STD cars.